After a long, hard winter, the last scenario I expected to see was low, warm water and with few fish in the river. Apparently, the Escoumins heats up quickly. The air temps were painfully hot and the river felt like bath water. You know it’s bad when our clothes were sweat soaked by 6:30am. The river was almost 70º at the start of the day. We fished the first pool on the river at high tide. The tide brought cool water in from the bay. Despite being a good tide, it didn’t bring salmon in with it. We decided to call it quits and head upriver to an impassible falls. We did see salmon upstream and some were large. The main problem was that the majority weren’t holding in areas that could be fished. They hung out in the well oxygenated water below the falls. Every once in a while we’d see one try to jump the falls in vain. The forecast was just as bad for the next day. I was planning on fishing the Escoumins for two and a half days. I decided to cut my losses, book an earlier ferry trip across the St. Lawrence, and head to my next destination a day early. 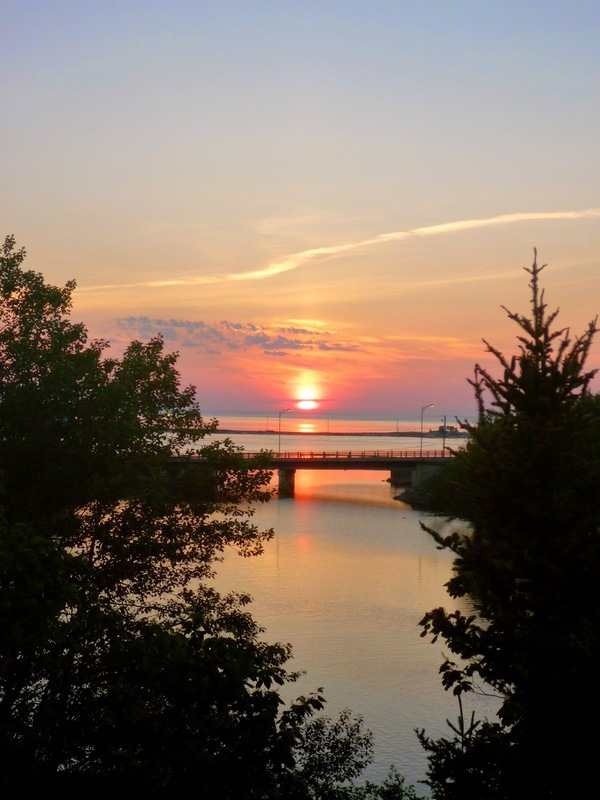 The next stop was the Gaspé Peninsula. It was a very nice ride. I passed many salmon rivers along the way. 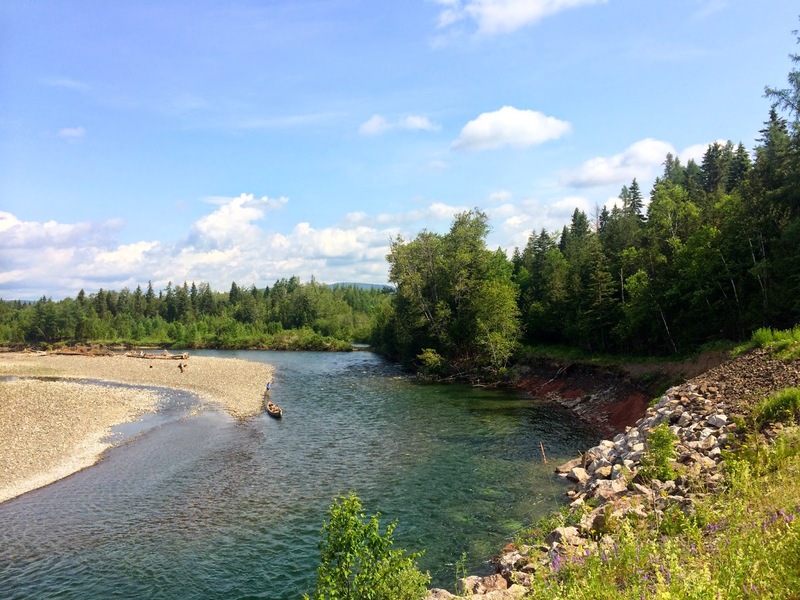 The highlight was seeing the legendary Restigouche River for the first time. 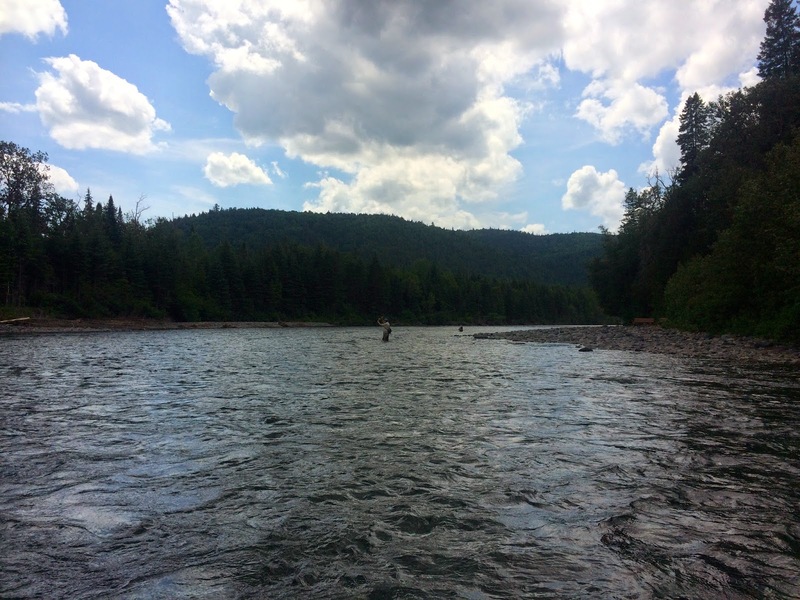 I considered stopping at the Matapedia to fish the unlimited rod water for the afternoon, but I decided to drive past it (painful as that was). 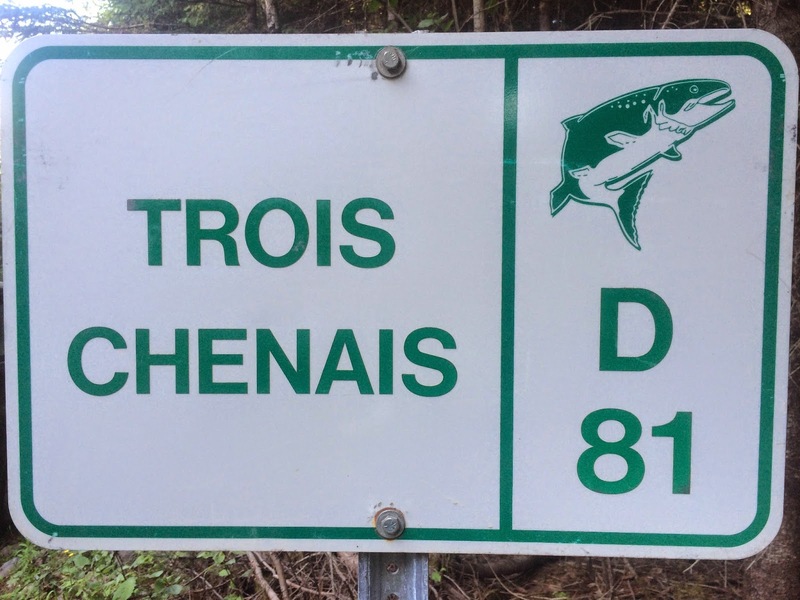 I was headed to a chalet on the Petite Cascsapedia to reunite with my first salmon fishing partners, Doug and Ray. They had won some November draws for the Petite and the Bonaventure, but had an open day mid-week. It would be great to be reunited on a salmon river after several years. I entered the 72 hour draw on the Grand Cascapedia and the 48 hours draws on both the Petite Cascapedia and the Bonaventure. I really wanted to fish the Grand. 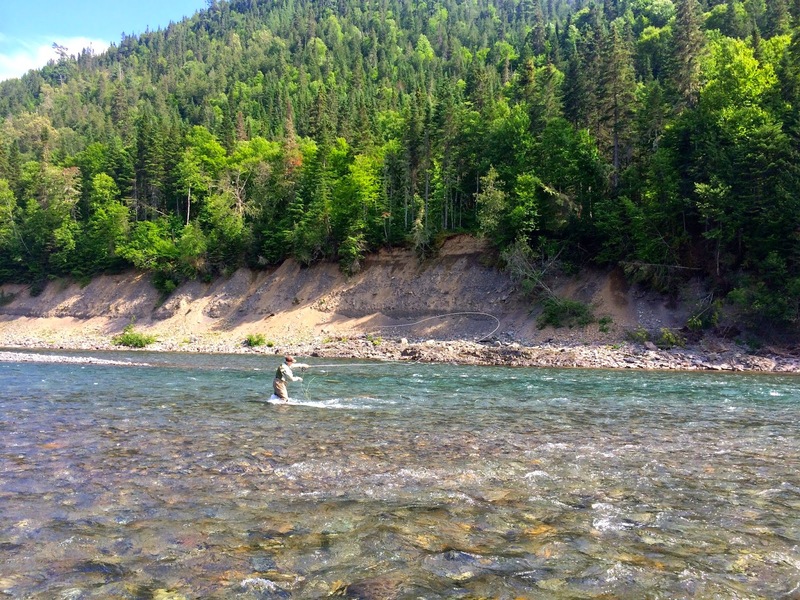 Besides being one of the world’s great big salmon rivers, it was the only one of the three that was actually fishing well. I didn’t win water on either the Grand or the Petite, unfortunately. It looked like I would be on the Bonaventure open water (C & D sectors) for the next five days. On the first day, I drove the entire length of D sector, stopping by almost every pool to scope out the unfamiliar water. To say the Bonaventure is visually stunning is an understatement. I’ve seen pictures and have heard about its crystal clear water for years, but seeing it in person is a whole different story. A common refrain goes something like, “Be careful where you wade. The water is so clear, you’ll think you’re stepping into a two foot hole and you’ll instantly be up too your chest in water.” It’s totally true and I made that mistake a few times. Unless I’m talking about the Bonnie, I’ll never use the term “gin clear” to describe a river ever again. I have fished some clear rivers in the past, but nothing comes close to this. I saw some great looking pools, but many should be fished from the far side of the river. Unlike the Escoumins, the water on the Bonaventure was relatively high and cold. Wading across would not be an option. 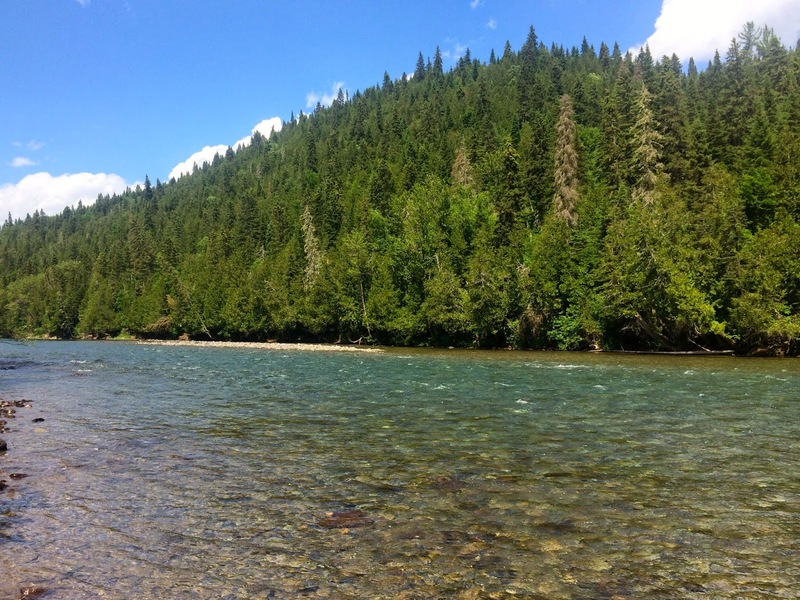 Sight fishing for salmon, which is the Bonaventure’s big draw, wasn't really an option, either. I would have loved to fish dry flies to spotted fish, but conditions were more conducive to covering water with wet flies. Too high to cross, even in the riffles. An even tougher pill to swallow…the runs on the Bonnie have been horrible this year. 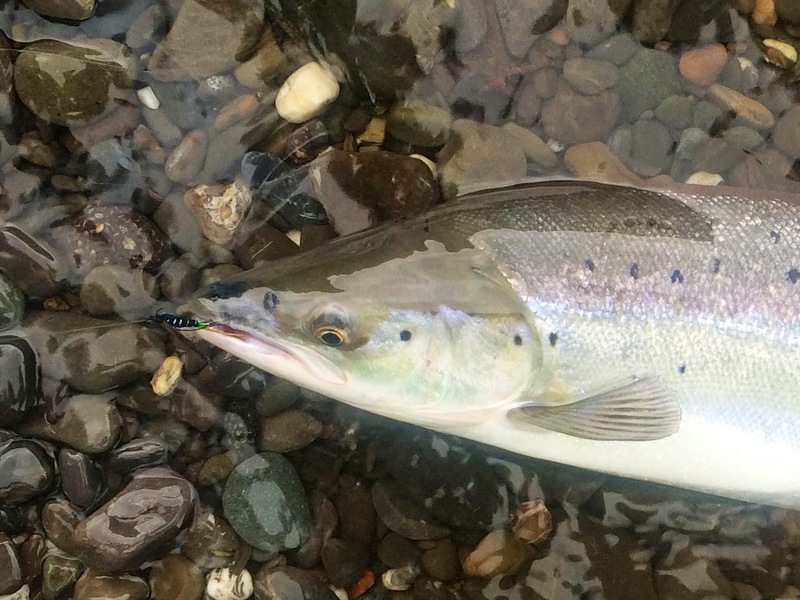 The multi sea-winter salmon have largely been absent so far this season. The place was a bit of a ghost town. At least it kept angling pressure down, I guess. I have to admit, I was starting to panic a bit. I tried to relax and continued checking out the pools. The first pool produced nothing and was clearly not a good pool to fish in high water. The second pool, however, looked promising. The money pool...at least for me it was. I knew that the grilse were starting to show up, so I went with a #4 white tailed Green Machine. It’s been good to me when there were grilse about. It was a good decision. I hooked into a 6lb. grilse on my first pass through the pool. This pool was tricky one to fish and wade. The grilse went berserk from the minute it was hooked. He sped downstream and ran directly underneath a row of overhanging trees. I managed to keep a tight line to him and, after a little chase downstream, landed him safely. He was probably the best looking and hardest fighting grilse I’ve ever caught. Unfortunately, he was kind of crazy and it was impossible to get a picture of him. I was relieved to be on the board on my first day fishing the Bonaventure…and on my birthday, no less! The next day, Doug, Ray and I fished C and D Sector together. It was great to be reunited with my old friends. The only action any of us had was in the first pool we fished. Doug pricked a salmon, but couldn’t get him to come back. I had one roll in front of me while I was fishing the lower end of the pool. I worked the rise with a Bomber for a while but, because of the rotation, I had to move on and leave the fish. I was on my own again on day three. We had gotten some heavy rain overnight. The river was a little higher than the day before, but still crystal clear. 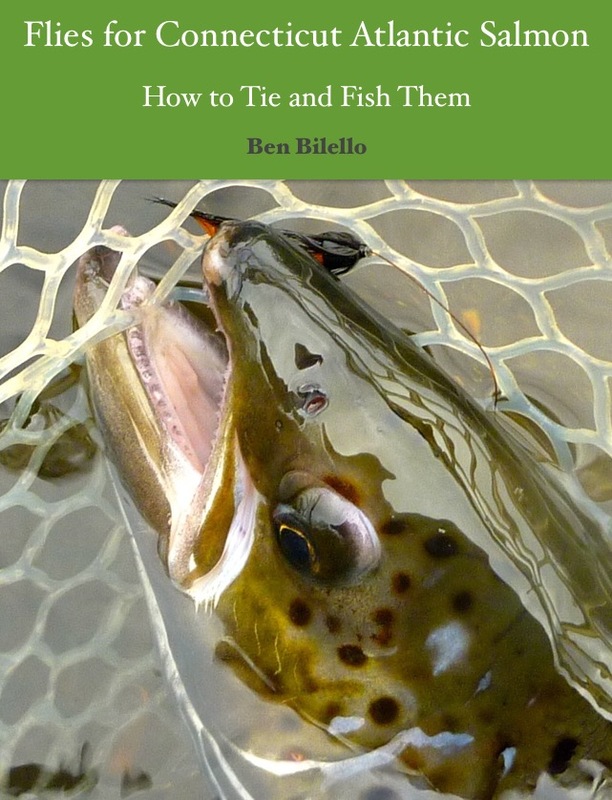 I went back to the same pool in which I caught the grilse and promptly hooked into another. This time, the fly was a #4 Blue Charm (Mike Crosby style). Despite having fished one for years, I’ve never had any luck with a Blue Charm before. This grilse was the opposite of the first. He really didn’t fight at all. I pretty much reeled him right in. He went berserk when I tried to take the hook out of his mouth though. I probably shouldn’t have been surprised…weird trip, weird fish. That would be the last of my action for the trip. I could tell the river was coming up and my window for good fishing was pretty much over. Once again, I decided to cut my losses and get back on the road earlier than planned. Hurricane Arthur was ripping through New England and on its way for eastern Canada. It was a good call. The Bonnie was blown out by the next day, trees came down and I heard the whole Peninsula lost power. The Escoumins was too low and hot. The Bonaventure was cold, higher than normal, and rising. There should have been a lot more fish in the Bonnie, but they just weren’t there. The Bonnie has a good ratio of salmon to grilse, but all I caught was grilse. One fought as hard as any grilse I’ve ever hooked and the other fought worse than any salmon I’ve ever hooked. I thought I would catch fish on the Escoumins and run the risk of getting skunked on the Bonnie. I probably did more driving than fishing on this trip. It was truly a trip of opposite extremes. If ever there was a trip to get skunked, this would have been the one. It didn’t happen though. I didn’t hook up with any msw salmon, but at least I had my pair of grilse. Two fish landed in two and a half days of fishing on the Bonaventure actually isn’t bad. Yet another skunking narrowly averted! Nice job making the most of poor conditions !